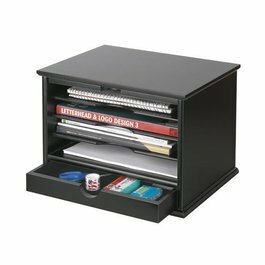 My favorite organizing products are often the most simple ones to get your paper organized. I love creating a Command tCenter with a desktop organizer. 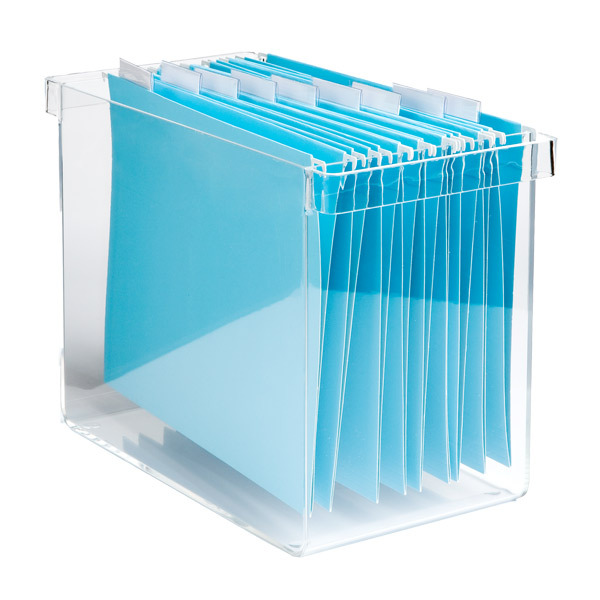 This clear lucite organizer works well in a small space for your papers. You can choose whatever colored hanging files to insert and use your label maker to create labels, such as Action, Pay, File, Receipts, and other categories of paper that you use frequently. If you are very, very visual, here is a product that can help you categorize your papers and keep these where you see them all the time. And when company is coming over, you can close up your work and keep it confidential. Again, use a label maker to categorize your slots. Otherwise, it will all be miscellaneous! Loving the product you use for organizing your papers makes all the difference! Summer’s here! And we are ready to get on the road or to the airport. Getting out of town and getting ready to travel can be very overwhelming. Here are a few tips to get started, get going and get organized. Start early. Flights are cheaper 21 days in advance. Hotel availability is better with advance notice. Pull out your calendars and make a plan to know what dates will work best for your family to go on vacation. Be sure to steer clear of beginnings and endings of big projects, as well as clear your calendar for a day after you return too. Your transition back to reality will be much happier. Get packing in this sequence: complete laundry, make list of attire, lay out clothes to view, then pack in suitcase. In order to be ready, complete laundry well in advance so you can pack well in advance. Pre-load your digital fun. Upload to your kindle, itouch, and other digital devices a week in advance. Think about using the app TripIt on your smartphone. You can consolidate information in a paperless way. You can store your paper documents in a special travel binder, adding items as you make reservations and plans. Get ready with coupons online from fun venues at your destination. Print or add to your smartphone to access these. Smartphone apps can help too. Gowalla gives you ideas at your destination. GasBuddy gives you locations for cheaper gas on your trip. Weatherbug gives you up to date weather forecasts. Pack the essentials in your carry on. Snacks, kid friendly fun, hand sanitizer, and your digital chargers are a must for getting there. 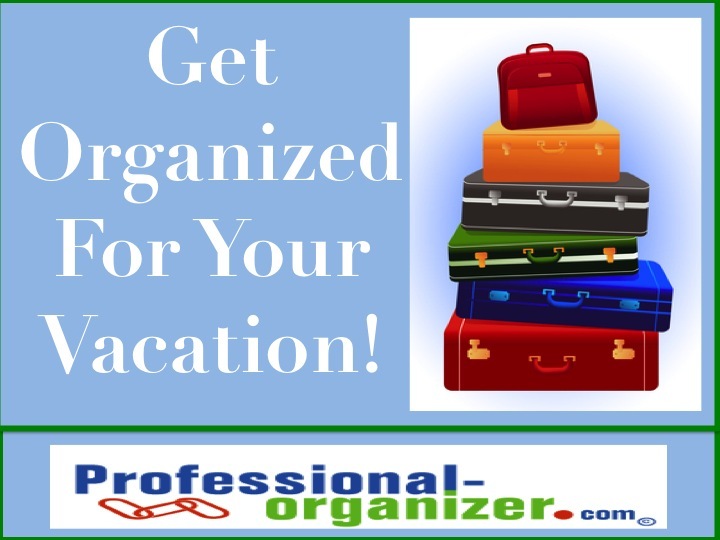 What are your ways to get organized for a vacation? Thanks to Microsoft for additional information on how to set up your Outlook! How has your new view of Outlook helped you with productivity? Join me at the Houston Galleria Microsoft Store for Get Organized with Microsoft Outlook! Overwhelmed by email? Can’t find a contact when you need it? Not sure of meeting dates for work or family activities? We will be sharing tips and tricks to get all of this together in one place, easy to access and making communication easy! Bring your laptop, slate or windows phone and play along with us. Happy organizing! Decluttering is all about making decisions. What to keep or release? What category is this item in? Where do I store it to know I have it? How many should I keep? These decisions can be hard! Why is decision making so difficult? Maybe you need the affirmation that you are making the “right” decision. Maybe you need ideas and could choose one to be the final decision. Maybe you need the energy and focus to think clearly about a decision? Maybe you have never had practice making decisions. Maybe you are too overwhelmed to know what decisions need to be made. Research shows that not only cognitive ability plays into decision making, but also emotions. 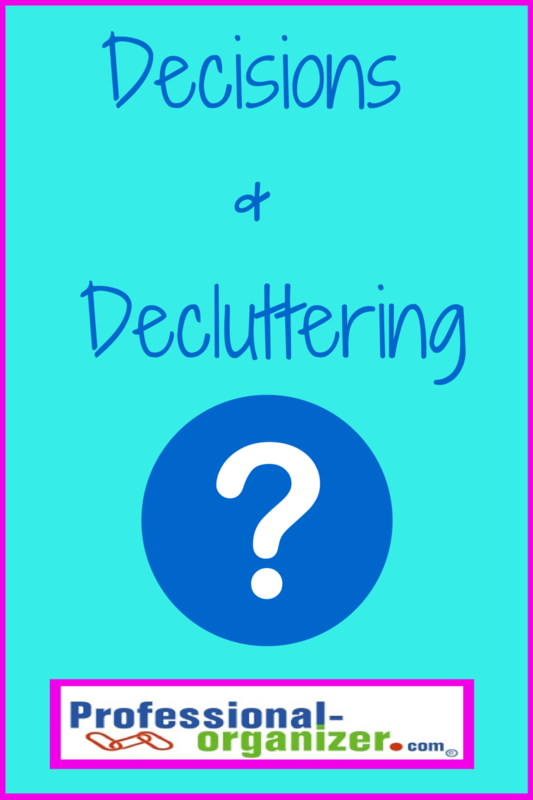 All of these aspects come into play when decisions and decluttering are linked. Here are a few ideas to help you make decisions that make sense, make letting go easier, and make a difference for you. Donate it if it is “good”. It is considered “good” if it can be used and still in working condition. Freecyle if it is broken. List it on freecycle.org and it will be picked up from your doorstep. Give it a moment, then give it away. Look at it, touch it, and then put it to the side. In a moment you will be ready to give it away. Set a number. How many do you think you need of any one object? Think of your own number as a guide. Compare two. Establish a “tournament”, do you prefer this or that? Set a boundary. Where does a specific item belong? That is the boundary, the space where the item will be confined. Let that guide you for how many and where to keep items. Gather items all together, see how many you have and need. Once you see items together, it is easier to decide what to keep. What is holding you back from making a decision? More ideas on decluttering in my monthly newsletter! Join here! It’s that time of year when the weather turns our thoughts to summer. Our last day of cooler weather is officially over, so let’s bring on the fun and sun! 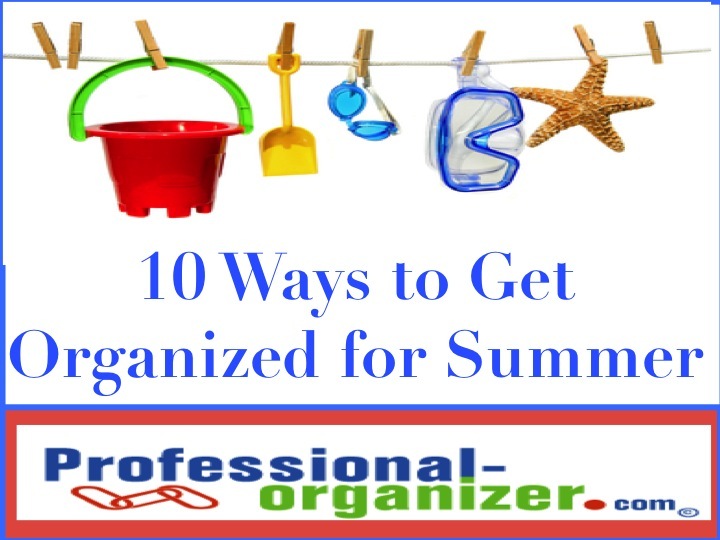 This list of will help you start your summer organizing! 1. Time to move out the winter wardrobe. Review what you have worn or not worn this year and decide to donate. Pack away the winter sweaters in a tote, ready to store in the back of your closet or under your bed. Review your coats in the coat closet, and decide if any of them are ready to donate. Then move them to the back of a less accessible closet. Shine up your winter boots and store these away too. 2. Check out the expiration dates of medicines, sunscreen and bug spray. Be prepared with medicines for allergies and bug bites, as well as sunscreen for your lips too. 3. Get your swim bags together for you and your kids. Pack the essentials, like sunscreen, but also some change, tissues, sun hat, and fun fan to keep cool. Load up your kindle, nook or tablet with a great book you have wanted to read. 4. Go through all the precious artwork and papers from your kids this school year. Keep only the most special, like the first 100 on a spelling test or a hand print turkey, to save in a box marked with that grade. Place the boxes in the top of your children’s closets. 5. Rinse out your coolers. Handprints and other dirt come off with a Clorox wipe or Mr. Clean Magic Eraser. Dry completely before storing in an easy to access spot in the garage. 6. Evenings are great time for outdoor fun, even in the heat. Pick up inexpensive outdoor fun, like bubbles, kick balls, sidewalk chalk, croquet or horseshoes for family fun. 7. Its enticing to drop all routines during the summer. Being well rested is important all year long! Be sure to set a bedtime for you and your kids this summer, turning off all electronics 30 minutes before slumber to ensure a great night’s rest. 8. Schedule some pampering with a cool summer haircut and pedicure for you and your kids. 9. Air up your bike tires and plan for summer picnics in the shade. Pick up some fresh new BPA-free waters bottles in different fun colors for everyone in the family and donate your used water bottles. 10. Host a family meeting and ask your kids and spouse about their summer wish list. What is the one most important thing for each person this summer? Be sure to mark your calendar to include everyone’s special activity during summer vacation, as well as block out your vacation, dates for summer camps, and July 4th holiday plans. Gather up ideas for summer fun from local papers, online or other moms. A little extra planning makes all the difference.